This new addition to the long running Logan McRae series sees him now working in Professional Standards, but nevertheless being given a murder to investigate. All the usual protagonists are here to a lesser or greater extent, as a detective thought to have committed suicide several years previously turns up dead in a crashed car. 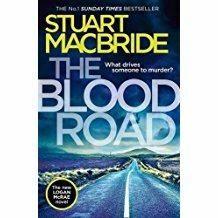 Throw in the death by hanging of another police officer and a series of child abductions, and you have MacBrides’s usual winning formula of police procedural combined with his trademark black humour. This novel is something of a return to form after a couple of shakier efforts, with the character of McCrae perhaps benefiting from being given a bit of a rest of late. Whatever the reason, the author is back at the top of his game with this one, even if he does overdo the black humour at times for me. Obviously it helps if you’re familiar with the characters from having read earlier novels in the series, but I think it also works as a standalone work too. Fans will definitely enjoy this one though. If you enjoy Ian Rankin, Peter James and the like you should definitely check out this series – there’s a whole treasure trove awaiting your discovery. First appearances are often deceptive! Bargepole, he is The Biz!